We have really enjoyed being tourists. Heading out the next day for Mannum, the plan was a circuit over to Mt Pleasant, Woodside, down to Hahndorf, then back to Murray Bridge. Like many of our trips we got off the main road and explored some beautiful country side, very picturesque little valleys and hamlets, typical South Australian history, with old bakery mills, churches and more vineyards feeding massive amounts of grape juice to well-known companies, others were very boutique and chocolate box picture card, and some just had very good wine. Lots of inspiring subjects to photograph and paint, but Scott was more driven by somewhere for lunch. The trip to Mannum took us back up along the Murray River; I was surprised when we turned off the highway to see we had missed Mannum on the way down. It was quite a big town with a lot of history, edged by the great Murray it was the birthplace of the Murray River paddle steamers, including the old Mary Ann built-in 1853. In 1897 one of the Shearer brothers, David, produced one of the first cars in Australia which featured a differential gear in an enclosed case. I have to admit I stole that bit of information, as I have no idea what a differential gear box is, but somebody out there may be interested. Mannum is another proud town of museums and art galleries, well worth visiting. 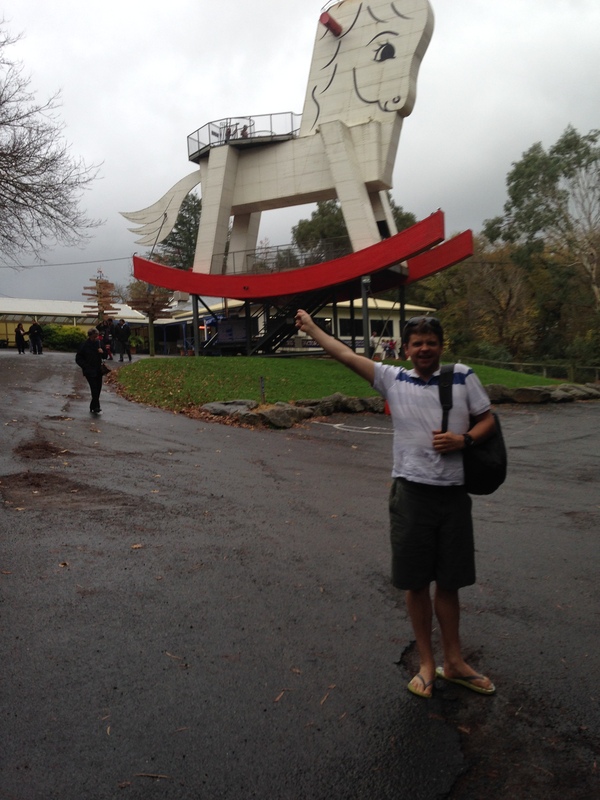 Next stop, the biggest Rocking horse in the southern hemisphere. I thought Scott would really get a kick out of it. But I got lost; it’s in Birdwood a small town in the Torrens Valley in the northern part of the popular Adelaide Hills. The region’s beauty would have been a welcome sight for German settlers escaping religious persecution in the 1840s. Like many of the German-settled towns in the area, Birdwood was originally named after a Prussian town, Blumberg. However, anti-German sentiment during World War I created a feeling of unrest and the town’s name was changed to Birdwood after the commander of the ANZAC forces in Gallipoli, Sir William Birdwood. We went around in circles, and lunch became much more important than a giant rocking horse or so Scott told me, as he grew more and more bored and suggested we should go home. Scott is a very good traveller and even better now after almost 5200 kilometres with me and a caravan as his only true company, but finding a lost horse was not as interesting to him as it was to me. We decided to head towards the largest Chocolate factory in the southern hemisphere, this was much more appealing and there was a moment of joy as Scott chatted about his favourites and how fat we were and how it would be very bad if we bought too many chocolates. Once again we missed the turn off and headed into Woodside, found a park and both decided a pub lunch would be well worth the effort to walk back up the street. Woodside is a quaint little town, very touristy and is just a few kilometres from the chocolate factory. How deceiving was the pub, we sat in the bar, it was one of those old bars and you could see through to the other room, where a couple of guys and girls were killing the afternoon playing pool. There were several stuffed deer heads on the walls and time had worn a scar across the front of the bar, where many knees had rubbed and scuffed over long drinking binges. Scott was really happy, food was coming and the young, attractive girl serving warmed to Scott immediately and he just bonded with his standard opening line, “When’s you birthday?” Any guys reading this, for some reason it works as an opening line, but I would learn to duck before you ask the question, as I don’t think everybody has the charm Scott does, it’s a gift. I’m not sure how much impact Scott had on the bar maid, but I have never seen fish and chips and a sea food platter like it, magnificent, huge and delicious. Scott couldn’t believe his eyes and there was a new kindling of hope that the day was about to get better. 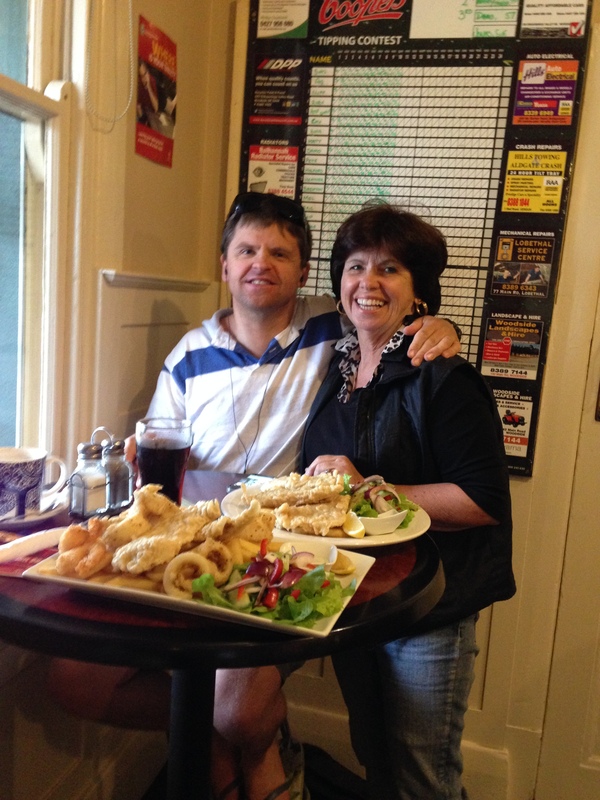 We struggled to get through the meal and even had to leave most of the crispy chips behind. This was all topped off with a coca cola and a cappuccino. We wobbled back to our car groaning and discussing the chocolate factory. Melba’s famous chocolate factory is in a historic cheese factory where you can watch a variety of confectionaries being made. The original old heritage chocolate and confectionery making machinery was still there and still being used today. The factory shop is the biggest retail area I have ever seen, packed with every conceivable sweetie and all sorts of gadgets old and new. Scott found a basket and off he went, as I looked over I could see a number of confused consumers as he chatted away, really excited to be surrounded by endless calories. He came back to me with a full basket and he left me with directions to return most of the items. We finished shopping and before I got to the counter Scott had already moved the crowd aside and found a sales person to complete our purchases. I don’t mind shopping with Scott, you always get served promptly and very few people intervene as Scott moves directly to the front of the line with me, ragged and apologising for his energy and disrespect for the waiting customers. People just look at him, then me and smile and say, no that’s OK go ahead. Although I do feel guilty and should ask Scott to conduct himself appropriately I am inclined to take advantage of the situation. Back to the car but I still felt I need to complete our day and see the world’s biggest rocking horse. So back to Birdwood for another look. This time Scott was the navigator and he took great pride in the fact we found it. I don’t know how we missed it the first time, it’s 18 meters high. Scott was not happy, especially when we went into the toy factory where he was very fidgety and intolerant and a little angry. I took him aside and asked what was wrong but he was even more irritated and angry. I found a quiet spot and asked him to tell me what was wrong and I would try to help him, but this seemed to inflame the distress even more, so I suggested he go outside for a while and I would follow in a few minutes. He really liked the idea and I thought maybe he just needed some space, we all do. When I went outside he was gone, I never really panic as the cord was never cut, it’s just invisible, he always finds his way back, so I just sat down outside and waited. As a parent your mind wonders when you don’t know where your child is, when they’re young you panic and find them, but now I had to be patient even though my mind started to think silly things, like what if somebody had taken him or he wandered off and got lost and my heart beats a little faster as I start to think I’m negligent and I should be more proactive about finding him. But to me it’s all common sense and I have to give the reins to him or he would never take responsibility for himself, best lessons are learnt by mistakes. If Scott can use a mobile phone, public transport and ask people directions then he’s not going to be far away. In his own way he asked for his independence many years ago. It was difficult to watch and wait while he sorted out in his way, how to get around and how to exist in a community. Together with a good community and support from lots of people, Scott has been able to learn more than I could have ever have imagined and he has evolved into a person who can take risks and grow wiser. I still worry and want to protect him, my motherly instincts are very strong but his determination to be free is even stronger. Finally, coming down from the men’s toilets was Scott, bright and happy and my beating heart was relieved and my negative, negligent thoughts were alleviated. I asked him why he was so distressed. It was the noise and high-pitched scream of excited children and loud intervening parents, plus the brushing and pushing of the people in a confined space. I also think the need to move on lunch and food we had gorged ourselves on was also a great relief. I think we under-estimate how miserable we are when our bodies don’t function properly and I think Scott is often in a stressed situation when nature calls. It had been a very long day and the drive seemed to take forever to reach Hahndorf, one of Australia’s oldest surviving German settlements. There is still a strong German flavour in Hahndorf, the smallgoods outlets and German bakeries that line the main street are colourful and full of delicious foods. 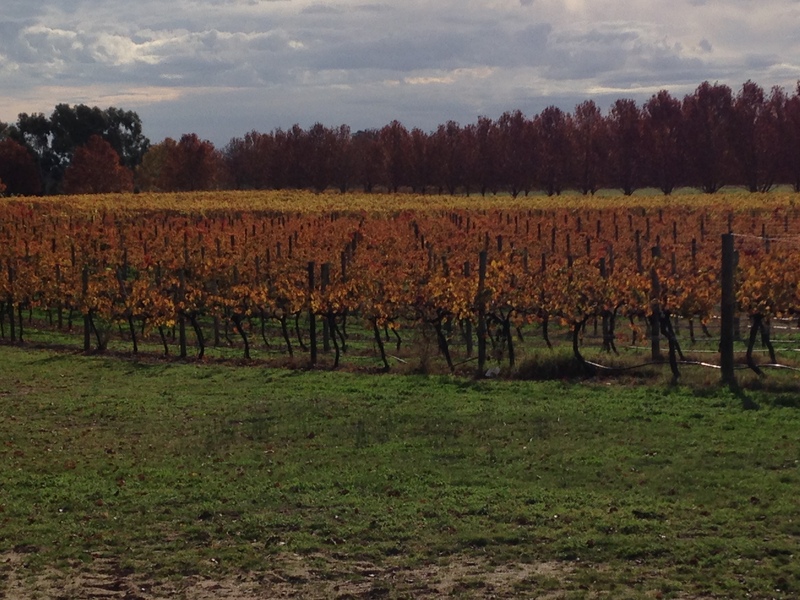 There are several boutique cellar doors and trendy eateries serving the fresh and local produce. But there was one more little drop-in before we reach the town, the Bird in the Hand winery. Scott had fallen asleep and I saw my opportunity to buy some nice wines for gifts when we got home, as we pulled into the park I told Scott to wait while I went in. It was a shame I was by myself and Scott was not a complimentary partner to enjoy the finer side of food and wine. I wandered through to the tasting room, I cannot speak highly enough of the hospitality and kindness the ladies and gentlemen showed me. It must have seemed strange a single, aging, sorry, maturing lady, all alone tasting a range of wines. An enjoyable memory even if a little lonely. With cases of wine and an assistant to take them back to the car, we were on our way again.